Earlier this year, I was asked to present at a professional development session for early childhood educators. The presentation? 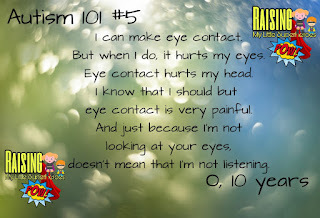 All about Autism and Sensory Processing Difficulties. The presentation was received so well that I thought that I would use part of my presentation on my blog as I'm often asked questions about Autism and O and L. So here goes!! 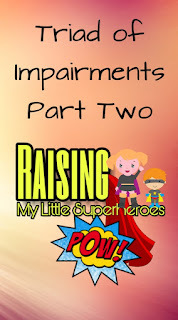 This is Part Two in which I'll focus on Impairment in Social Interaction. 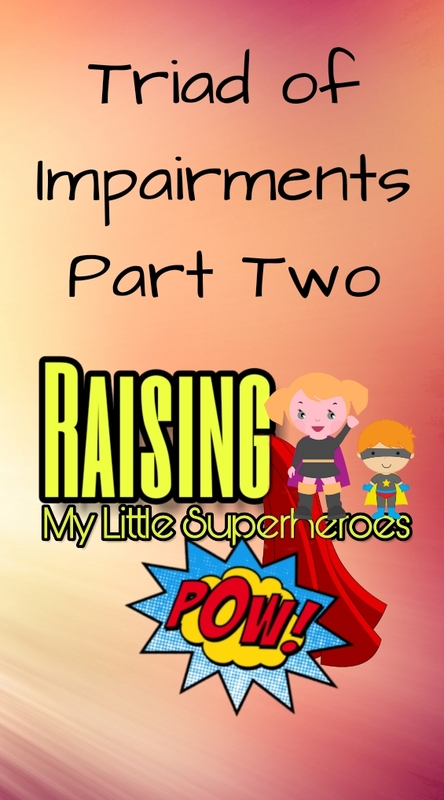 You can access Part One - Communication Impairment here! 3. Restricted and Repetitive Behaviours, activities and interests. Before I begin to discuss the next area, Impairment in Social Interaction, keep in mind that many of these traits are present in typically developing children. The difference in those diagnosed with ASD, is the intensity in which these traits present. In a child with ASD, the traits are much, much more intense and they are ongoing. I’m going to refer to children with Autism but all of these traits may be present in Autistic adults as well. Children may have difficulty in reading the intentions and motivations of their peers. They may have difficulty in displaying and responding to non-verbal communication from their peers – eye contact, body language, facial expressions, tone of voice, gestures and so on. They may have difficulty in recognizing social cues – when to talk, when to stop talking, how close to stand to people, personal space and so on. These are all considered to be hidden communication skills and they can be very difficult for a child with Autism to understand and interpret. Children may have difficulty in understanding social interactions and the hidden communication that occurs during social interactions. This can be especially tricky when people say one thing, yet do or mean another. Children with Autism can at times seem to be very distant. They can appear to be emotionally disconnected from their parents, siblings and their peers. They may not react any differently to a scowl then they would to a laugh or a smile. It is important to understand and remember that they are not emotionally disconnected, they simply may not yet have developed the ability to understand or pick up on social cues as efficiently or as quickly as typically developing children. Children may have difficulty in initiating play and/or responding to others. Children with ASD may seem disinterested in engaging with play with other children. It’s not that they don’t want to, they may not know how to. They may not understand or know how to turn take or share. They may have difficulties in developing and maintaining friendships with others that are appropriate for their age level. Due to their social impairments, children may prefer solitary play. Children with Autism often have difficulty establishing and maintaining friendships, as they have difficulty reading the intentions, the motivations or the reactions of others. They may not openly share their interests and engage with others or they may appear disinterested. Often it’s their lack of communication skills, not a lack of desire, which prohibits this engagement. 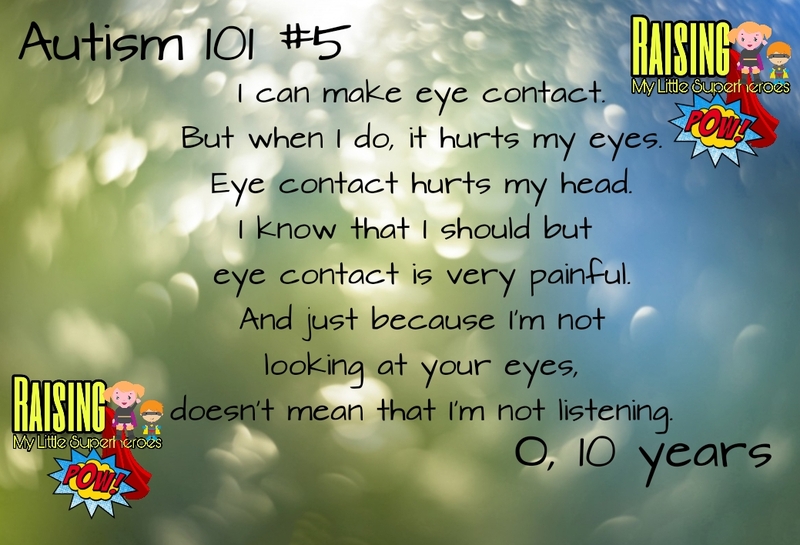 Children may have reduced eye contact – eye contact can be very uncomfortable for those diagnosed with ASD. However, some individuals learn very early on that eye contact is socially accepted so they will make fleeting eye contact or they will make eye contact and stare straight through you. Without these social skills individuals diagnosed with ASD may appear socially inept or disinterested when in fact they have major deficits in being able to interpret and respond appropriately. Many individuals who have been diagnosed with ASD, O and L included, want to be social however they struggle in this area. Stay tuned for Part Three - Restricted and Repetitive Behaviours, activities and interests.